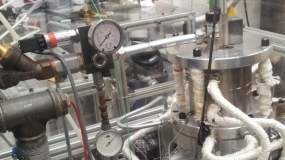 IPU has collaborated to the realization of a new type of heating engine that can create mechanical work from heat, whatever the source of heat may be. IPU has assisted the Norwegian company Viking Development Group in development, manufacturing and test of a new type of heating engine based on a double-acting cylinder. The engine can create mechanical work from heat, and it is designed to deliver 7 kW work on the basis of heat supplied at temperatures of up to 200°C and a suitable source of cooling. The heat may derive from the sun, biomass, waste heat or the like, as the design is independent of the type of heat source. The engine is based on a new cycle (patent application approved), but can also work as an Organic Rankine Cycle (ORC). It is specified to deliver 7 kW work at 200°C at a rotational speed of 1500 RPM. IPU has also been in charge of the design and assembly of the belonging process system for handling the process medium together with the systems for heating and cooling. In addition to the building of the belonging system for data collection and processing. The project was a “proof of concept” project and had to be realised within a limited time frame. IPU managed to determine the basic design, make detailed drawings, have the necessary parts manufactured, and mounted the engine and the belonging system, so that the engine was ready for testing 11 months upon start-up of the project. Analyzing, energy optimizing, modelling, and product development within the field of thermo-dynamic systems and energy solutions. Particular strong in modelling of cooling processes.